Yes! This meal is entirely gluten-free, in addition to being paleo and kid friendly! We also want all our friends to be able to enjoy this flavor bomb, so it can be adapted for our vegetarian friends as well- just take out the bacon completely, or replace with your favorite meat substitute. How Long Does This Meal Last? Not only is this savory breakfast hash full of flavor, but it will also last in the fridge all week! That’s a win-win in our books. If you’re using this recipe for meal prep like us, just make the breakfast hash ahead of time, and fry up an egg or two when you’re ready to eat it. You can also freeze it if you make too much to eat in a week, and enjoy this yummy breakfast on any busy morning. What Seasonings Can I Use? This recipe only calls for a couple seasonings, but sometimes we want to spice things up a bit! (See what we did there?) All of these options include salt, pepper, and garlic- in addition to these combinations below. If you want to keep it simple, try using some Garlic Supreme. This will add a nice subtle flavor, and you obviously will want to use this in place of the minced garlic. Next, to really spice things up, sprinkle with cumin, oregano, chili powder, paprika and hot sauce. Don’t forget to the guac! For a yummy savory option, use fresh rosemary, and top with some parmesan cheese. First, a traditional favorite breakfast: German Pancakes. Whether you call this breakfast German Pancakes, Dutch Baby, or Mountains the result is the same: a delicious, and fairly simple, dish everyone will enjoy. Have you ever heard of Breakfast Pizza?! Boy, are you missing out. Some of us eat left over pizza for breakfast #noshame, but why not make a real Breakfast Pizza? You can thank us later. Now, if you’ve been around long enough, you know we are team #crockpot. This Slow Cooker Breakfast Casserole will not disappoint. You can start it the night before a busy morning, and voila! Breakfast is served. 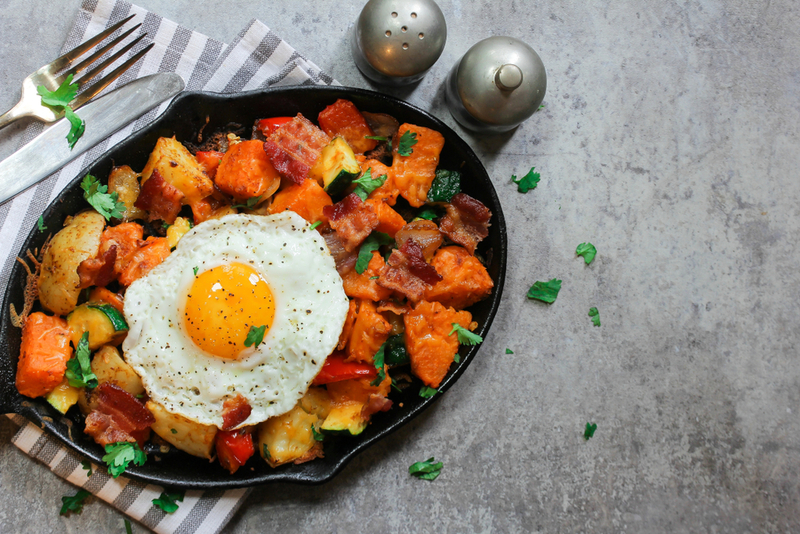 This Bacon Sweet Potato Hash is a delicious and healthy way to change breakfast up, and is a great way to get breakfast on the table fast! Cook bacon in a large skillet until crisp then remove from the skillet to a paper-towel-lined plate. Leave the bacon fat in the skillet. Add the potatoes, onions and peppers to the skillet, season with salt and pepper and cook over medium-medium/high heat searing fast to brown then reduce the heat, grate in the garlic and cook 10-12 minutes or until the potatoes are tender, stirring occasionally. Pour in the vinegar and continue cooking until it’s absorbed. Taste and adjust salt and pepper as necessary. Return the bacon to hash and add the parsley, combining. Optional: Crack four eggs over sweet potato hash. Place skillet in a preheated 425 degrees oven and cook for about 10-15 minutes until eggs are set.